Thanks for the fun guys. Difficult for me to join in the chat as the wife and daughter are generally at the other end of the room watching a movie so my inane jabbering would interrupt their viewing and their movie noise in the background would probably be picked up by the mic which I am sure you could all do without! Some great fun and exciting racing eventually.. the waiting was the only pain but I understand the problems the extra numbers cause. Great to see so many like minded drivers looking for some racing fun The first time i've really experienced this in pCars having previously only had full grids in F1 series. Clearly need to get my qualifying in order as it's something I never work on preferring to concentrate on the race itself and working through the field but the possibility of split grids mean qualifying is much more important now. Second race was pretty eventful.. got nudged into the wall off the start resulting in slightly damaged suspension but the chaos around turn 1 and resultant safety car meant I could pit under caution although rejoining at the rear. Made some good progress and was running up in 6th at about the halfway point and then had an incident at Maggots with Dan I think.. I tihnk it ended his race and although I was able to carry on after limping to the pits I was a lap down when I rejoined. Managed to claw my way back to 11th before the finish. Race 3 was a bit more straightforward, starting 6th and getting away cleanly before the safety car brought things back. Was running in the 4 but then a slight error, I think into Brooklands when I lost the back end, put me down a couple of places. Made one up when passing my team mate when he went wide out of Copse and was running in 5th for the rest of the race. Again backend caught me out at Brooklands on the penultimate lap and I almost collected my team mate but thankfully we both survived to come home in 5th and 6th although we lost a ton of time when we both seemed to be waiting for each other, each thinking the incident was our fault lol. I think a bit of team radio may be on the cards next time out. I tried to give October the position at the end of the final lap as I felt I had impeded him when correcting my error the previous lap but it caused a bit of confusion and he almost collided with Rebel I think.. apologies for that but no harm done in the end. Firstly, can I please thank everyone who raced last night even with all the issues that we were facing. This was the first time here at the DSRL that we had the requirement to have 2 lobbies for qualifying and racing, which caught me quite off guard. This does further prove that if you intend on racing then please post 'IN' on the sign in thread. This will allow me and any other hosts the time to organise the lobby settings and who is going to qualify with who. In the end, qualifying was as close as I expected it to be. It really is a track that shows off commitment and a very rapid car. I thought the racing is getting better and better. Yes there are still issues with lag but for most of the time it is really really good. Thanks for everyones patience once again and hopefully there are lessons that can be learnt from and things can be better and more organised. Webbers88 wrote: Firstly, can I please thank everyone who raced last night even with all the issues that we were facing. 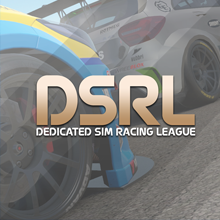 This was the first time here at the DSRL that we had the requirement to have 2 lobbies for qualifying and racing, which caught me quite off guard. This does further prove that if you intend on racing then please post 'IN' on the sign in thread. This will allow me and any other hosts the time to organise the lobby settings and who is going to qualify with who. With everything going on on the night you did a good job mate. It must be a nightmare trying to work these things out on the fly Connection wise I had no issues at all, smooth as silk but I know others seemed to be struggling. Yeah it was definitely a learning experience I have to say. My connection was alright. But I know there were others that were struggling and I did see it a couple of times but not many. I do appreciate the hosts erring on the side of inclusiveness as opposed to a reserve system for drivers, even though it was difficult and proved to be a long wait. I had no issues myself, as I didn't mind the wait and the racing was fantastic. There is a good mix of speed and skill, with competition being very close. Lag issues were annoying, but TBH I felt like they were very very mild seeing how all of us were scattered across the globe. Sometimes posting a speed test to the host's city helps (I turn off all HUD, incl. the tags, as they kill immersion), but in general I just try to give more room. Being hardwired and kicking up my internet speed (had to finally cut the cable TV cord, which I will never regret) also helps. The only lag effect I experienced, though, was chirp/skipping, which ever really impacted my race. (As for chat, I have to turn the engine volume up after the start, which silences most chat in the race, for two reasons -- it's hard to hear the sound cues that are critical for racing unless the engine is dominant, and the chatter does not help concentration, as I can get all position information from vrHive and the Crew Chief app). Race 1- This was the stevelow/octoberdusk throw-down. lol. Has trouble with the first turn on both lap one and two, with me almost collecting Webber on #1, and allowing steve to close up on #2. Brooklands lap 6/7, I didn't try to defend much, as Steve seems to be faster at that point. The rest of the race was spent trying to spook/throw off/pressure him into a mistake. All of which failed miserably. lol. Steve showed poise and speed and it was a pleasure racing him. I'm not sure what caused him to pit on lap 18, as I didn't see any signs of contact or injury. I thought maybe we had shortened the race, but others seemed to race to the end. Sad, since steve clearly deserved that one. Race 3 - This was the teammate throw-down. Hammer and I went at it hammer and tongs. Great fun, as we both tried to "out polite" each other. Next time, not so polite. :cyclops: No idea what happened to me into the first turn kink, but I was definitely snaking my way through. Looked like Steve (or McNasty) and I may have come together into 1, but hard to tell, as the collision was not seen, just felt. Managed to end up behind stevelow again! lol. Some serious drama allowed me to slot into 5th place as lap one ended. Again, lucky. After the restart, the teammate battle began. (We have number issues clearly, lol, so I'll take #59, since I got beaten by Mr. Hammer ). Nothing but very close, clean racing until the end, when we both apparently thought the other deserved to finish ahead. Congrats to aidtheace for taking the triple crown! Good job at juggling all the balls and keeping them in the air !!!!! Orange Tiger, that clip is awesome. Here's my race 2 start...pretty much sums up this weekend for me. all in all i blame everyone in front of me in the points and they should all be docked all their points. I suppose we all have race days like that. But hopefully they don't come around that often. I think racing mostly GT3 in career mode doesn't help as there a lot more robust than a single seater. I had a cracking race 1. Got the pole and pulled away at the start graddually from RD to 8 seconds. I then had a half spin in copse, gathered up and went on the attack to close down a 2 second lead on RD. Managed to retake the lead after a good run through turn 1 and had the job done into turn 2 and then RD unfortunately spun it. And race 3 i dont know how i went from 16th to 6th on the opening lap. I avoided like 3 crashes and spinning cars everywere and then on the saftey car restart overtook someone into turn 2. And then 3 people went wide into the last turn at luthfield and i swept around the inside to take 2nd. Webbers was then in the lead and i was on the back into copse. He ran a touch wide and the car twicthed and spat him into the wall.